Inti levis Hansson, body in dorsal view. From ZooTaxa 2729:58-64. Inti levis Hansson, head in frontal view. 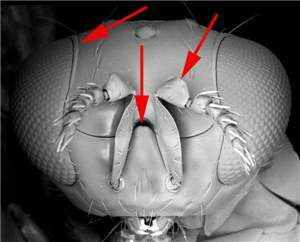 Arrows point at groove close to eye margin, protruding upper part of insterscrobal surface, dorsal edge on pedicel. From ZooTaxa 2729:58-64. 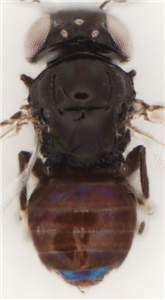 Inti levis Hansson, mesosoma in dorsal view. Arrows point at carina along sidelobe of mesoscutum, notauli, stout setae on mesoscutum and scutellum. From ZooTaxa 2729:58-64. 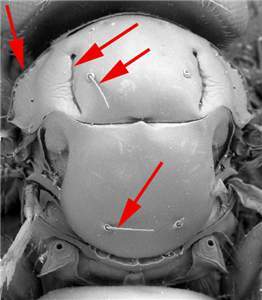 Head and body smooth and shiny, without reticulation; frons with upper part of interscrobal surface protruding up and over frontal suture; vertex and upper frons close to eye margin with a groove; scape and pedicel compressed and wide, and pedicel with a dorsal edge; single pair of setae on midlobe of mesoscutum and scutellum stout; notauli as deep and narrow grooves in posterior 2/3, terminating just before transscutal articulation and with a fovea in very anterior part; sidelobe of mesoscutum with margin between dorsal and lateral parts as a sharp carina; propodeum with wide median carina; forewing with basal � bare.